There are times when neither of both players can win the game, so the game ends at equality. This means that the game ends in a draw (a tie). The game could end in a draw even if one side has a big advantage over the other side, an advantage that would normally help him win the game. Let's analyze the situations in which a game ends in a draw. It's very important to know what are the situations in which a draw can occur. 1. Draw by agreement: Both sides come to an agreement over the fact that the game is a draw. This usually happens during the end game when the result of the game is more easily anticipated and both players realize that neither of them will win the game no matter what happens. 2. 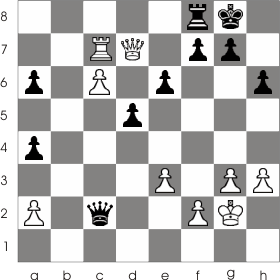 The fifty move rule: When a player has its turn to move and he indicates that there have been made 50 moves without any piece being captured or without any pawn being moved. 3. Threefold repetition: When a player has its turn to move announces that he is making a move that will result in a position that repeats itself the third time. The position is repeating if the same pieces occupies the same squares they occupied at a past position. 7. Kf1-f2 Qd1-d2+ 8. Kf2-f1 Qd2-d1+ 9. Kf1-f2 Qd1-d2+ 10. Kf2-g1 Avoids game draw by threefold repetition. 11... Qd2-e1+ 12. Kg1-g2 Qe1-e2+ 13. Kg2-h1 Again avoids game draw by threefold repetition. And now the game is drawn by threefold repetition. they have no available squares on which to move. they are blocked by other pieces. they are in the way of an enemy piece that aim the king therefore they are not allowed to move.